The architecture agnostic isFunctionReturn test for basic blocks does not detect x86 "RET N" (N!=0) instructions as returning from a function because such instructions have side effects that apply after the return-to address is popped from the stack. 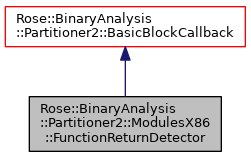 Therefore this basic block callback looks for such instructions and sets the isFunctionReturn property for the basic block. Definition at line 85 of file ModulesX86.h. Definition at line 87 of file ModulesX86.h.